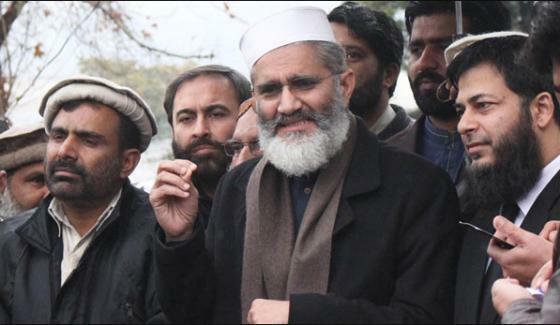 Jamaat-i-Islami (JI) Ameer Senator Sirajul Haq said if Pakistan’s corrupt rulers were imposed on Japan only for two years, they would make even that country bankrupt. Addressing the Faisalabad District Bar Association Saturday, he said the outgoing vice president of the US had to sell his house for the treatment of his son, whereas Pakistan’s prime minister and his sons were exchanging gifts of billions. He said all state institutions in the country were running in heavy losses, while the factories and business of the ruling family were rolling out billions in profits. He said after the prime minister was asked about his earnings, he got infuriated and accused the questioner of ill intentions. “If the prime minister had an Aladdin lamp, I would request him to lend it to the nation for a few days so that the country was able to pay back IMF and World Bank loans,” he remarked. Haq stressed that Pakistan had come into being through the struggle of an advocate and not a feudal lord. He urged the bar members to support the JI for making the country corruption free. He said that the JI leadership was free from corruption—which had been testified even by the Supreme Court. JI’s war was not against any person or party, he said, adding that if the prime minister did something good, the JI would be the first to appreciate that. “If the PM raises his voice for the release of Dr Aafia Siddiqui, the whole nation would salute him,” he added. He said the US wanted to divide the Pakistani nation into Shias and Sunnis to plunge the country into a civil war. He said the people who had been living in five-marla houses in the past had built palaces spread over two acres due to loot and plunder. He said the culture of the rulers did not match with that of the citizens, adding the JI wanted to throw out the elite culture from the country. JI ameer said the rulers had detained Hafiz Saeed to please Trump. However, he was sure that the days of US slaves were numbered. The JI chief assured the lawyers of full support in his demand for a high court bench at Faisalabad. Faisalabad Bar President Rana Ali Abbas welcomed the JI chief on the occasion. JI MPA Dr Syed Waseem Akhtar was also present.